You can download our catalog of accessories and tools. It is an Adobe Acrobat PDF file. To download the catalog, right-click the link below and choose Save Target As or Save Link As. You can then view or print the catalog. To view the catalog online, click the link below. 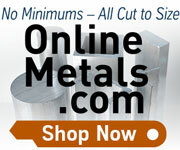 Our catalog does not include all the replacement parts for the mini lathe, mini mill, and micro mill. Use our Replacement Parts page to find them. You may also wish to see data sheets for the machines we sell.